The Surrey town of Staines has officially changed its name to Staines-upon-Thames in an attempt to boost its riverside image. Councillors voted for the change last year after the town became synonymous with Sacha Baron Cohen's spoof rapper Ali G.
The name officially changed at 14:00 BST and followed a day of celebrations, including a regatta, in the town. Critics, including the town's football club, have labelled it "pretentious". Spelthorne Borough Council hopes the change will attract more business to the town, which sits on the banks of the River Thames. Councillor Colin Davis, who was behind the name change, said the town's image had needed help for some time. "Ali G may have had a role, but I think it goes back further than that," he said. And he said the new name would help people from outside the town understand its riverside links. He added: "I regard Ali G as someone who put Staines on the map, we're just telling people where it is." 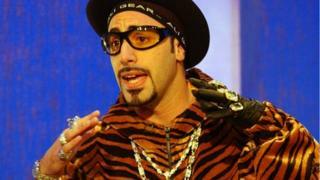 However, Steve Parsons, who is the club secretary of Staines Town Football Club and campaigned against the change, said: "The council have decided they don't want to be linked with the Ali G show. "But the one they need to worry about is Keeping Up Appearances, where Mrs Bucket changed her name to Bouquet. "I think it is as pretentious as that." Alex Tribick, chairman of the Spelthorne Business Forum, defended the change as a "progressive". He said: "It's not pretentious, it's progress and the fact of the matter is there was a public consultation that returned with a two to one majority in favour of a change." The Lord-Lieutenant of Surrey, Dame Sarah Goad, was responsible for officially changing the name. Am I Sacha Baron Cohen's next target?